Home Gaming Between 14 & 18 and love Tech? Check out Cyber Discovery. As a kid I could only dream of opportunities like this for myself and my sisters, it's something that could open many doors for today's youth, Cyber Discovery is a Government-funded, free, extra-curricular programme for teens between the ages of 14-18 which uses games, challenges, and role-playing to teach the basics of cyber security, in order to be able to be part of this students will have to complete as many challenges as possible, to apply to the online assessment phase they will need to click here and enter by the 31st January 2019, yes that date is very close so get your entries in fast. Kids today are getting savvier with technology, they're able to teach their parents new things as well as their peers, the world is growing with its technology and being able to learn new skills and more about it at a younger age can often help lead the younger generation to find out what vocation they enjoy most. No experience is needed to apply for this so those who have always wanted to learn more and have no idea where to start this will be a great time to try it out and those who already are experienced in one way or another can broaden their knowledge. Entry is free and you can either participate as an individual or part of a Cyber Discovery club. The programme is run by club leaders who are usually teachers and parents. The Programme has four different stages, first, you must start by registering for Cyber Discovery and then you will participate in a fun online assessment called CyberStart Assess. The programme runs every year and continues where you left off until you reach the age limit, after that you can apply to become a club leader if you wish. Students who are now too old but joined in the last intake of the programme will be invited back as graduated students for a bonus one year of alumni access to online portions of the programme! (There is more information on this on the website in the FAQs section). This one is pretty simple, you will need to signup/register with the site by the 31st of January, it doesn't matter what your age is at this point as you can either do the programme if you’re 14-18 or become a club leader if you’re over 18. If you enter your details after this date you can pre-register for next time, you will then be given a reminder email closer to the time that registrations opens again for the next year, which is a big help for those who may end up forgetting about it. 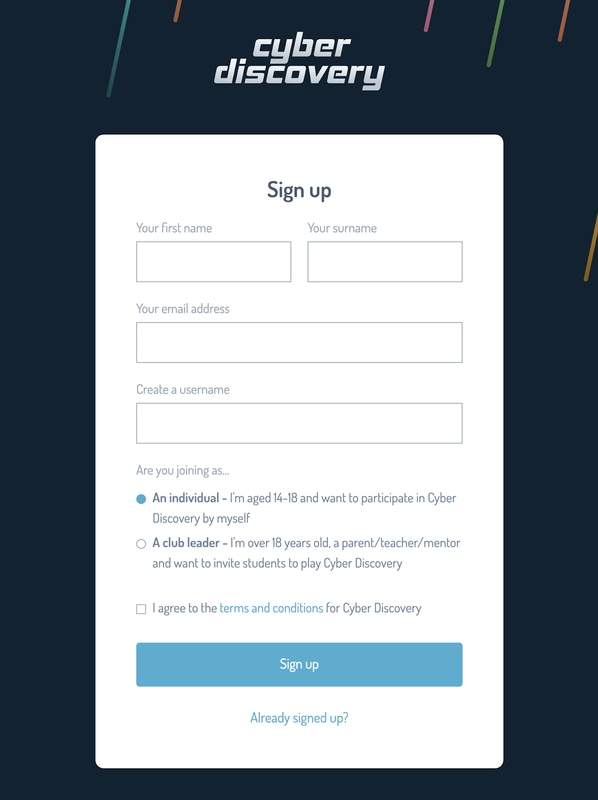 Using the login details that you created when signing up to Cyber Discovery you will then be able to login to the Cyber Discovery portal and access CyberStart Assess. Once you have done this you can start the challenges, if you're nervous about anything Cyber Discovery has a blog which gives you tips HERE. Once you start the challenges you will find that each one is harder than the next, the great thing about this is that it can show you how hard you can work on these challenges and push yourself to get to the next, you can either stay on a challenge you're stuck on or move on to the next and come back to the one you were struggling with. In order to complete the challenges, you will input your answer into a box and click submit code. If you get it wrong you can always try again and your overall score will appear in your student timeline in the Cyber Discovery portal after this which will help you keep track of your overall score. The great thing about this programme is that it allows you to look on the internet for tips and clues in order to complete a challenge. You can keep working in order to improve your score to help you move onto the next stage of the programme, your performance in this first stage will help to determine if you will move onto stage 2. Last year 23k people took part in the programme and 92% rated their experience as 'good' or 'very good', that, in my opinion, is a brilliant overall percentage for a programme like this. It shows that it's worth a try!